@Nokia_Connects has loaned me a Nokia Lumia 920 to try out. This is the first time I’ve used a Windows Phone device for more than a few minutes. The Lumia runs Windows Phone 8 While there are a few things I don’t like about WP8, I’m enjoying the overall user experience. It’s refreshingly different than anything else and fast, fluid and, for the most part, very intuitive. As a Linux user I wondered if it would be possible to connect the Lumia with my Ubuntu laptop and transfer photos, music, videos and documents back and forth. At one time their were some issues with MTP support in Linux, but they seem to be mostly fixed. At least when when connect my Nexus S phone running Android 4.1 to my PC running the ancient, but still supported, Ubuntu 10.04 LTS, a Nautilus file explorer window pops up showing the phone’s internal “memory card” and I can copy files back and forth between PC and phone. If I drop music files or videos anywhere in the Android phone’s drive, the Android Media player finds and plays them with no issues. So it should “just work” with Windows Phone too, right? Well, yes and no. 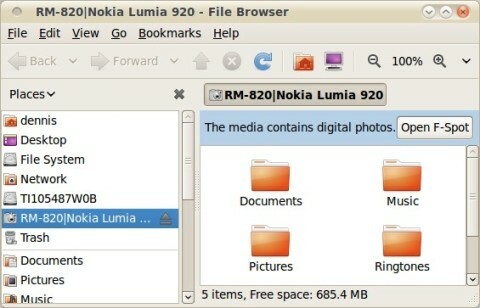 When I connected the Lumia to my Ubuntu Linux box with a USB cable, as expected, Linux recognized the Lumia as an MPT storage device and opened a Nautilus window displaying the phone’s pictures, documents, music, ringtones and videos folders (image, above). That looked promising so I tried copying various types of files to and from what seemed like the appropriate folders. The results were mixed. Images and Videos, Phone to PC: I could open my photos and videos on the phone using the Gnome image viewer or VLC Player and I could copy them to a folder on the PC. Ringtones: Full track .mp3 (but not .m4a) songs copied into the phone’s Ringtones folder could be used as ringtones. Documents: Text files and Microsoft Office documents that had been saved with Microsoft Office and copied into the phone’s Documents folder could be opened with the phone’s Office app. PDFs copied to the phones’s Documents folder could be opened using the free Microsoft PDF Viewer from the Windows Store. Images, PC to Phone: Copying .jpeg or .png images to the phone’s picture folder or any of its subfolders has problems. The copy seem to work, the phone could be disconnected, power-cycled and re-connected and the files were still on the phone. However the images were not not visible in the phone’s Photos Hub gallery. Videos and Music, PC to phone: Videos or music files copied to their respective folders were not recognized by the WP8 Music and Video Hub media player either. Documents: If I created a document or spreadsheet with Libre Office or Open Office and saved in MS Office format, it could not be opened with the Office app, which claimed the document was corrupt! Office 2007 on Windows XP and Google Docs opened the “corrupt” files with no complaint. Video files, PC to Phone: Use Bluetooth. Videos in .mp4, .3gp, and 3g2 formats played on the phone when sent with Bluetooth. They could be found in the Photo Hub’s Saved Pictures album and replayed from there. Videos in .ogv, webm, .avi or .mov formats that I tried failed to play. Music, PC to phone: Use Qlix (image, below), a small app intended to transfer music to Media Transfer Protocol (MTP) devices like the Microsoft’s Zune. It’s a bit primitive, you can’t transfer whole folders of music in a single operation although you can multi-select files in a single folder for transfer, but it works and preserves song titles, artist and album names and cover art. Sending music to the phone with Bluetooth also sort of works. The tracks I sent played and were saved the Music & Videos Hub. But even thought files had ID3v1 tags with artist, album and title information, they where saved on the phone with the filename as the song title (Blue Highway.M4A for example) and with Unknown as the artist and track. There doesn’t seem to be any way to edit the title on the phone or add the artist and album name either. Libre Office and Open Office Documents: Convert with Google Drive. Office on the phone complains that documents saved in MS Office format by Libre Office or Open Office are corrupt. But if you upload the documents to Google Drive in either MS Doc format or native ODF format and then download them from Drive in Office format, Office on the phone can open them. It’s all a bit kludgy, but by using a combination of USB, Bluetooth and Qlix I can move documents, music, photos, videos, and ringtones between my phone and computer. Which is as much as you can do with Microsoft’s Windows Phone app for Windows 7 and 8 and apparently more than you can with a Mac. Regarding “Images, PC to Phone”: apparently they appear after you take a new picture with the phone. I’ve had a windows Nokia 920 for over a year. Never once had to connect to any computer, Linux or otherwise. It’s called skydrive. UC Browser for Windows Phone is just a skin over Internet Explorer. If IE can display Bangla then UC should too. If IE can’t complain to Microsoft. Windows Phones, is mostly for Social Networking. The problems you occured can’t be fixed even on the updates.